PIK1010 Aircraft chocks made exclusively for large, heavy aircraft. Typical users include: Field Based Operators, Ground Support Equipment and the military. 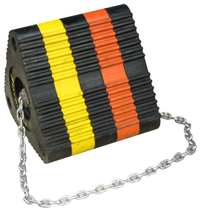 They come ready to use with a heavy duty, high quality rope attached for easy handling. For Air Bus, boeing. Pik India is a esteemed organisation who has been in the line of manufacturing Rubber wheel ckock, Hoses Since 1978. Acknowledged as the pioneer in non-tyre product innovation and is prime supplier to Defence, Industrial, Automotive and Consumer Markets. Pik India manufacture the widest range of Rubber wheel ckocks, wooden chocks , pvc chock,low, high and medium pressure hoses for Hydraulic, Mineral, fuel oil, Steam, Air, Gas, Water and other liquids and fluids and manufacture other hose tube and pipe for numerous Industries as per their design and specifications. Pik India Hydraulic Hoses are flexible connection for hydraulic power transmission system in cranes, dozer, dumper, loader, excavators, hydraulic roof supporters, tractor and hydraulic equipment's used in surface and underground refineries, constructions, shipping, automotive, railways, mining, cement, chemical, machine tools, steel, oil exploration, agriculture and various other Industries, where safety and stands are of utmost important.